Scott has worked in coaching & athlete development for over 30 years working with local, national and international cyclists. Coach Scott has a proven track record and has helped beginners complete their 1st century ride through to elite riders competing at the Commonwealth Games and Youth Olympics. 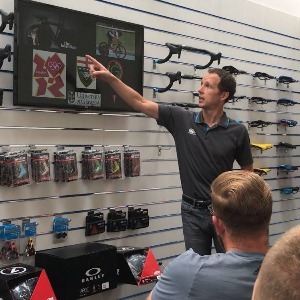 Scott works with all age groups and offers one to one support, club and team coaching seminars, training camps, bike fits & offers a range of training methods & plans that work to individual needs. Coach Scott is an honours graduate in Sports Science with a British Cycling Level 2 coaching badge. His coaching pedigree is supported with over 20 years as a Director of Sport within a Sports College in the UK. He was a student of Pete Keen CBE (Performance Director for British Cycling from 1997 to 2003, amongst other roles). During this time Coach Scott got to work with the likes of Olympic pursuit champion Chris Boardman and it ignited a passion for fitness and performance that grows continually. He has coached several National Champions in Scotland in cycling and duathlons and coached the African nation of Ghana at the 2014 Commonwealth Games. He received commendations from both the Ghana Sports Minister and the African Sports Council for his work and continued work of the team via training and mechanical support post games. However, coach Scott is not exclusive to the elite! He prides himself in his ability to assist a rider getting on the bike for the first time in years as much as someone winning a title! Coach Scott's own career was promising but illness and an accident that left him with slight paralysis in his left leg and a metal plate in his neck was the coaching worlds gain! He has a passion and a flair for developing riders to challenge themselves before they challenge others. These 'mental' approaches to rider development are not common outside of the elite professional world of cycling and are just one of the reasons that Coach Scott is so highly regarded. Coach Scott works with athletes with either heart rate monitors and/or power meters. Success. Coach Scott Maclean has been notified of your message.